There are many badly dressed people at Pitti. There are also people like Luca Rubinacci, Lino Ieluzzi, Ignatious Joseph and others – one-man brands – that benefitted hugely from being shot by Scott Schuman and need to be there to maintain that profile. But there is also no other place in the world where you get such a concentration of sartorially inspired clothing. There are only ever a handful of people whose looks I would adopt wholesale, but on the other hand almost everyone has some little thing I admire. 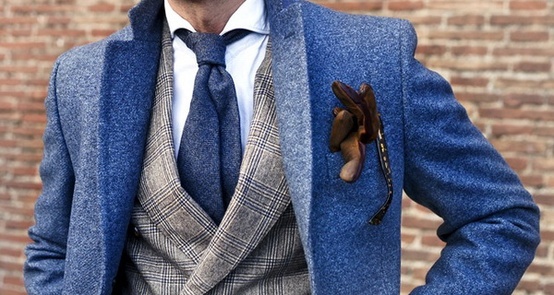 I like the blue textures and how well they go with the mid-brown gloves in the picture above, for example. I collect photos from Pitti, as well as from the Armoury and other blogs, on my Pinterest board. It is more for my own recollection that anything else – each has a little note on it to remind me of what I liked about the outfit. But readers might also find it interesting, so I mention it here. I only use one board, Permanent Style. You can follow the discussion on My note board on Pinterest by entering your email address in the box below. You will then receive an email every time a new comment is added. These will also contain a link to a page where you can stop the alerts, and remove all of your related data from the site. Long live mid-tone blue and brown!!! I’ts always been my favorite combination; nobody seems to ever agree with me though. Maybe I’m hanging out with the wrong people. Interestingly enough, your Pinterest executes what we all do spontaneously. I was struck by your choices! By no means all, but a great deal of them have drawn my attention too! Now a question: do you mean the tweed coat worn by our Japanese friend has been made by Dunhill? Be that as it may,your Pïnterest is a very good experiment, and I hope it will remain alongside your usual posts. For sure, your venture is more interesting than I all what I have seen so far on the web. I see that a great deal of your ‘pins’ are from The Armoury and why not. The site, along with yours, are the most inspirational sites in existence and for different reasons. The only criticism i have is the Armoury site does not have a search tool and one has to go back to older posts one by one and, much to my disappointment, i have never made it back to the first page! Despite me having contacted them and suggested an improvement it has not been forthcoming. What a terrible shame. Love your ‘pins’ they are so ‘Permanent Style’. A superb resource, thanks. It fills that gap between you giving advice on clothing here and providing actual inspiration; your captions are very useful too. Permanent Style keeps on getting stronger!